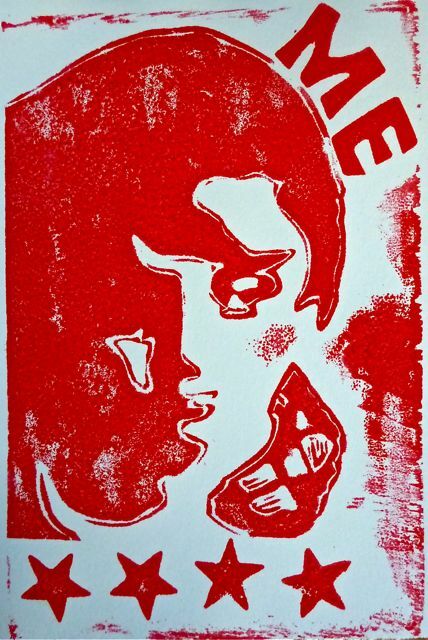 Monoprint by Flora Doehler, 2010. 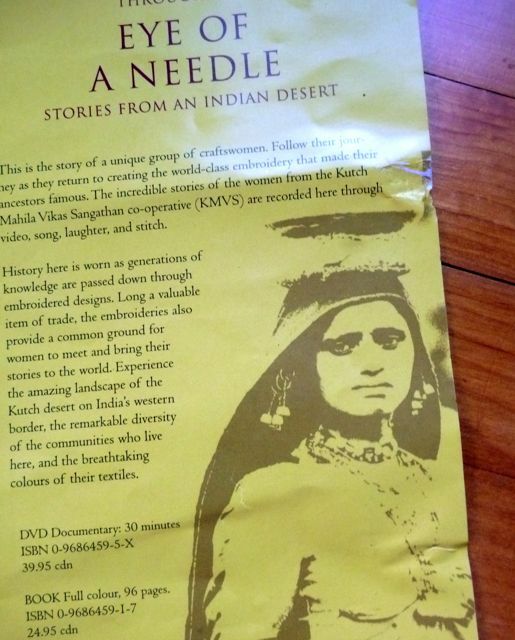 Through the Eye of a Needle: stories from an Indian desert. I fished it out and thought about what it was that drew me to the image. The photo itself looked timeless. It could have been 100 years old. The colours reminded me of the plants in my garden and the growth and passing of people. The posterization of the woman stripped away her personal details and left an impression of the person. And the expression on her face was so earnest, so sad. There is a photo of her in full colour at the end of this 2 minute video promotion for the book and DVD right here and she is definitley living in the here and now. The photo reminded me of old family photos I have of my ancestors. I’ve long wanted to create a group portrait using photos of all of us at similar ages and that’s a project I’d like to take on this winter. 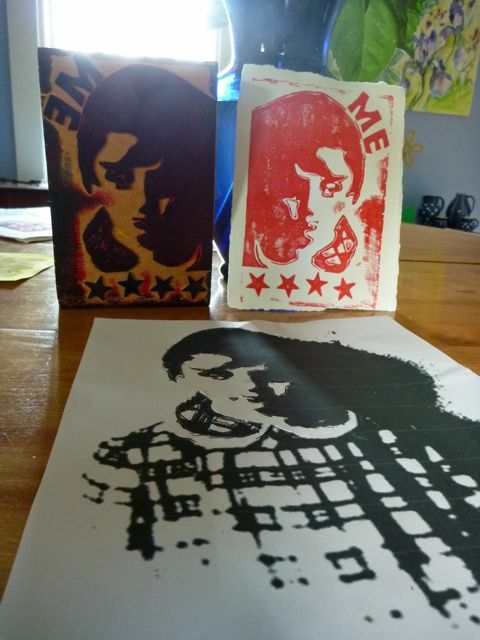 I wondered how I could translate a photo into a mono print. 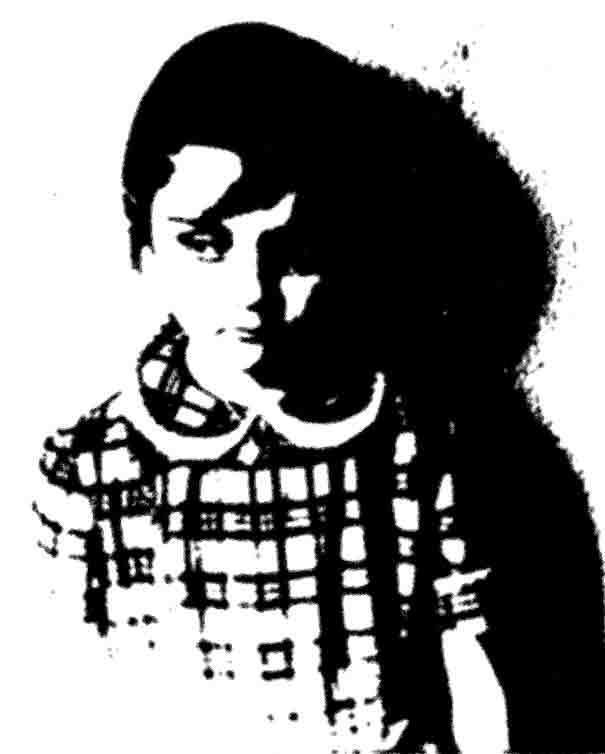 I looked for photos with good contrast and found one of myself taken when I was six. Elements is a less expensive version of Photoshop. I also think that it's easier to use. Next, I printed the photo out on paper and placed it over a piece of foam. Then outlined the black edges of the portrait while pressing hard with a ball-point pen. This made an indented line in the piece of foam. I removed the paper and went over the indented line once more with my pen. The foam parts will print out and I cut away all the parts that I wanted to remain white. I left a 1/16th of an edge of foam beside the pen line which will stay white. 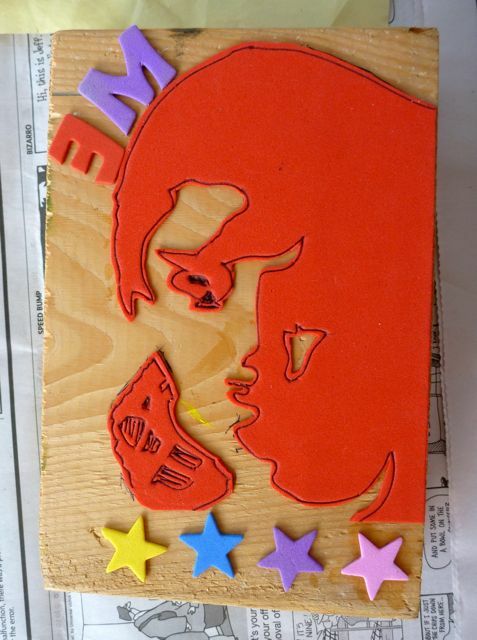 Then I glued the results on a piece of wood and added some precut letters and stars. 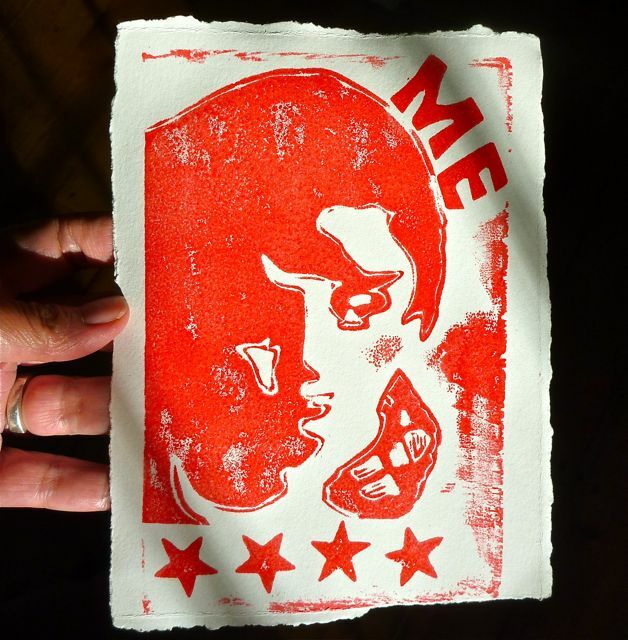 Attach the letters backwards because the resulting print will be a mirror image of the printing block. I inked the foam and printed. I’m pumped now to work on a ancestoral portrait series thanks to that wistful discarded image that inspired me. Inspiration is everywhere. With the next image I'll be more mindful and remember to flip my photo before I trace it so that it comes out the 'right' way. Very cool effect.. I thought the original picture looked like you.. I was not sure if it were you or your daughter 🙂 Love it! Thanks Deb. My daughter (and son) were both very blonde children………and that dress is right out of the 50’s so it’s me alright! I wish I still had the little locket. I loved that thing! lol! I love what you’ve done here. 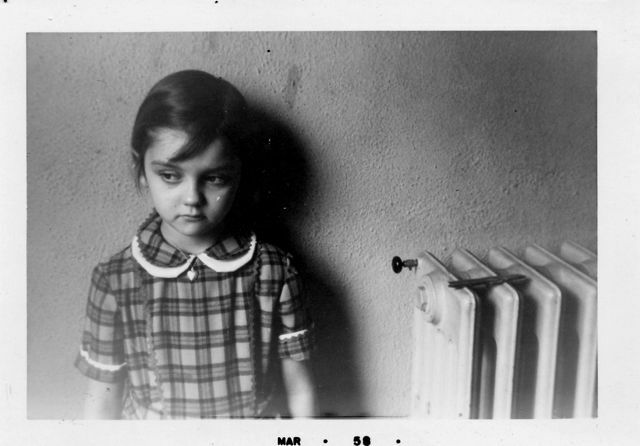 Great blog, and sweet (though very sad) picture. but I must have been imagining it because it didn’t show up. You did leave a comment before, but for some strange reason I published the post twice and your comment was attached to the extra post. I couldn’t ‘move it over’. I’m not sure why I looked so earnest in that photo, but here is one from the same month. 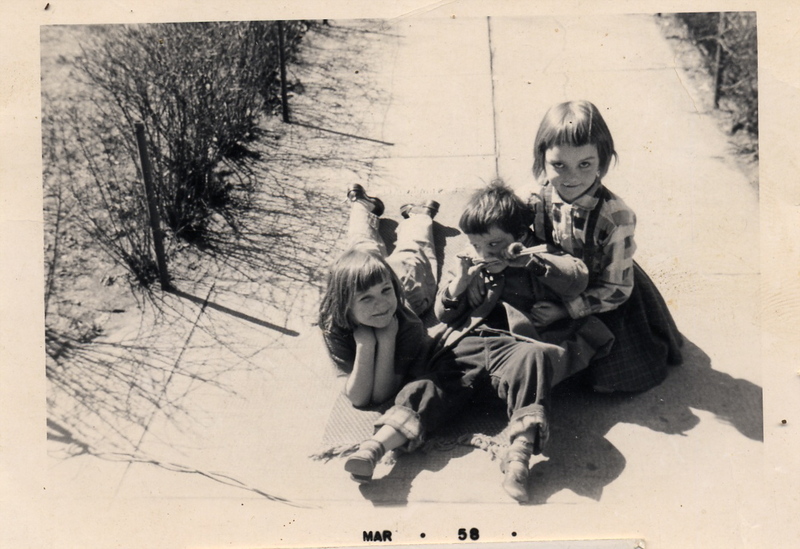 I had cut my own bangs and I am with my best friend Heather and holding my little sister, Gretchen who would be institutionalized forever within months of this photo, so there was a lot of sadness at home about that. She’s doing well living in Toronto now in a marvellous group home.